Nam June Paik is one of the pioneers of video art. His opus reaches from TV compositions, installations, video to media sculpturing. The new museum to be built in Korea, Paik homeland, will host permanent collection of his famous work and will represent a center for media and time related arts. We proposed a building that nests in the valley surrounded with pine forests. The shape corresponds to the topology. Exhibition space was defined as one continuous space, through which the viewer is ‘transported’ on slowly moving revolving stairs. In this way artist is offered another way of presenting than in usual ‘walk through’ exhibition spaces. 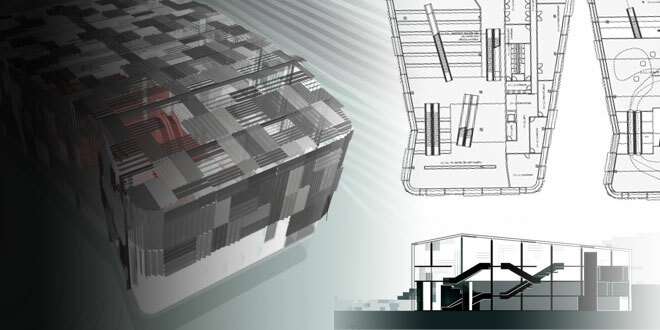 The glass facade is embraced by batteries of shutters which adjust the light in the interior to the right level. The museum reflects during the day and glows during the night. In collaboration with Holger Gladys.